In 2007, I was at home in Wellington with my first baby. My favourite excuse to get out of the house and free my mind of baby-brain was to go walking along the south coast. I usually started at Island Bay and, depending on the direction of the wind or my mood, turned either left or right. Turning right took me in the direction of Owhiro Bay, where a row of houses have their faces turned to the ocean, and eventually to the carpark at the edge of Te Kopahau reserve. That carpark is where I have done some of my best and most important thinking. I used to drive around the coast in my big old car, finishing in the carpark, and looking out at the churning sea in all weather, watching the ferries cruise by on calm days, or feeling the wind rattle the car while I listened to music. It’s hard to put into words the effect that place had on me and how it helped me get through some of the most difficult times in my life. On one of those walks with my son I was struck by an idea. With no pen and paper on me, I rang myself on my mobile phone and left myself a message, describing a boy who finds a sealskin hidden in a cave at Red Rocks. He takes it home and hides it under his bed. Soon, he sees a mysterious red-haired woman in a shabby overcoat wandering the streets of Island Bay, looking in people’s windows. More details poured out, and when I got home I transcribed the message and wrote the first chapter of Red Rocks. I have always been attracted to the idea of the selkie myth, where seal-women shed their skins to walk on land and are taken as wives by fishermen who hide their skins. The story made me think of romantic, windswept coasts in Ireland, Scotland, and the Orkney Islands. I’m not sure where I first heard about it, but I do remember a novel by George Mackay Brown, Beside the Ocean of Time, set in Orkney, that I read a long time ago and loved. What if the seals at Red Rocks in Wellington were also selkies? What if a modern-day boy found a skin and took it home? After I had my second son, and was living in Christchurch, homesick for Wellington and that wild coast, I pulled out that first chapter. Instantly I was transported back to that setting. I could feel the wind in my face, taste the salt on my tongue. Suddenly I wanted to find out what happened to that little boy, who had the sealskin hidden under his bed, and to the young woman who was searching desperately for it. And I began to write. I had my own children in mind as the audience for this book, and I am delighted to share it with other children, and adults, as well. Author’s Note, or Never let the facts get in the way of a good story. 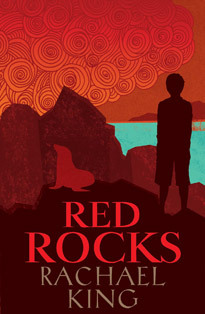 I’ve taken a few liberties with the ‘truth’ when writing Red Rocks, in order to bring an archetypal story, of female seals and fishermen, to the setting I love so much. The seals at Red Rocks are male bachelors, who find themselves without a mate, usually due to more dominant males, and come to Red Rocks to wait out the breeding season. I think of it as a ‘bachelor party’. In real life, Ted, Jake and Jake’s dad would not be fishing in that area. In 2008, the Taputeranga marine reserve, which takes in Houghton Bay, Island Bay, and Owhiro Bay, was formed, which does not allow any marine life to be caught and taken from the protected area. For information about the New Zealand fur seal, please visit The Department of Conservation – NZ fur seal and Te Ara. Find out more about Red Rocks, and how to get there. Learn more about the selkie myth of Celtic and Norse origin. For an interview with Rachael about Red Rocks, go here.